Growing up, there were two things that my family seemed to enjoy doing together when we went out - bowling and mini golf. They're the types of things you can do over and over again, and it's never quite the same experience. Many of today's bowling alleys and mini golf courses have put a different spin on my favorite pastimes of yesterday, keeping them fresh and fun for a whole new generation. 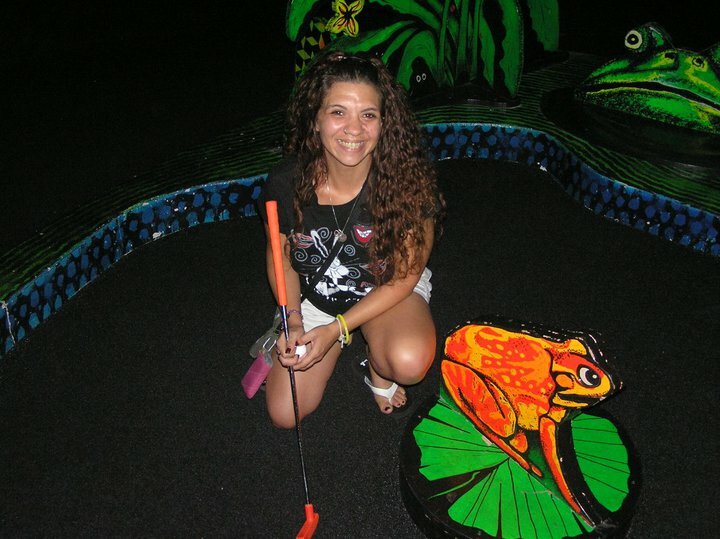 One thing we have more than a couple of here in The City Beautiful - mini golf courses. I have two particular favorites, and they're as different as night and day. 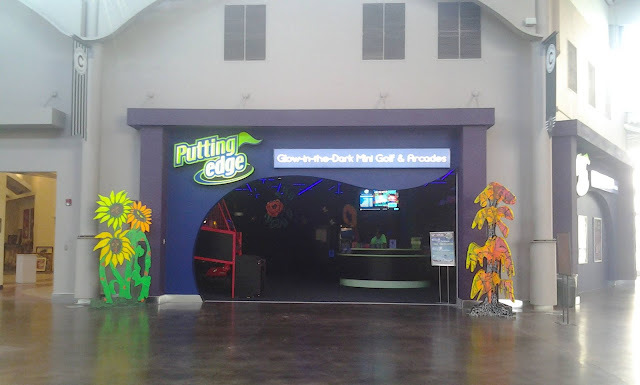 Located at Artegon Marketplace on International Drive, Putting Edge has one extraordinary advantage in Orlando's mini golf market... it's indoors! That's right - there's no chance of your game getting rained out, or Aunt Mabel getting heat stroke, when you tackle the Putting Edge course. This is one of the reasons why my family has made this a regular stop on our summer fun route. Putting Edge has five locations in the United States, but this is the only one in Florida. When Festival Bay transformed, most inhabitants vacated, paving the way for the creative new twist in retail provided by Artegon. Putting Edge is one of the few that stuck around throughout the revamp. 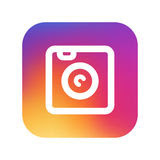 Positioned just outside of Cinemark Theatres, Putting Edge provides a perfect complement to an afternoon shopping excursion or an evening of entertainment. 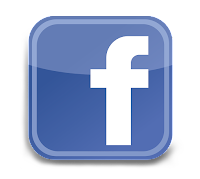 They open daily at 11:00AM (10:00AM on Saturdays), and remain open until at least 8:00PM every night. Don't let the looks of Putting Edge deceive you - there's a large world of golfing fun inside that small-looking space. Even more alluring... it GLOWS! 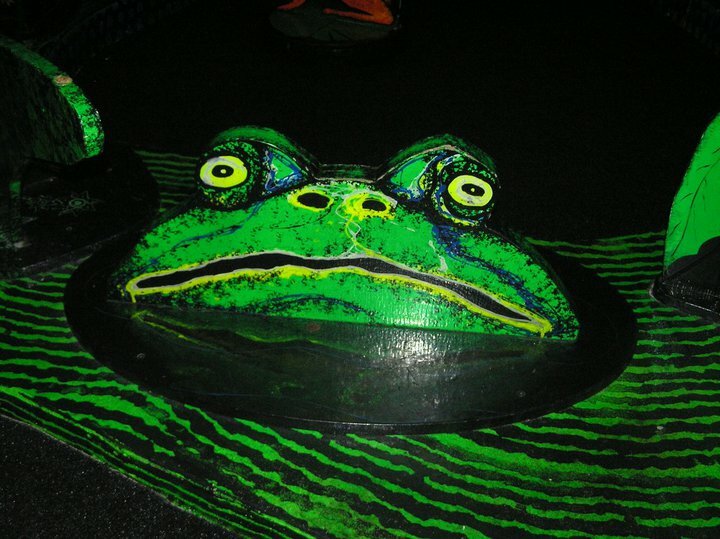 The entire course is blacklit, providing for some truly enchanting scenery. Just because it's indoors doesn't mean that it can't have the visual appeal that typically accompanies a mini golf experience! 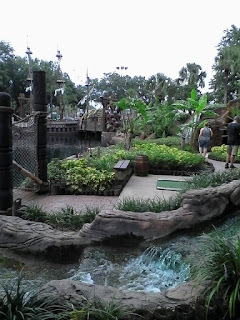 18 holes are lined with vibrantly funky Dr. Seuss-esque scenes - underwater, the forest, or a Medieval castle. All of these whimsical adornments really add something to the game. 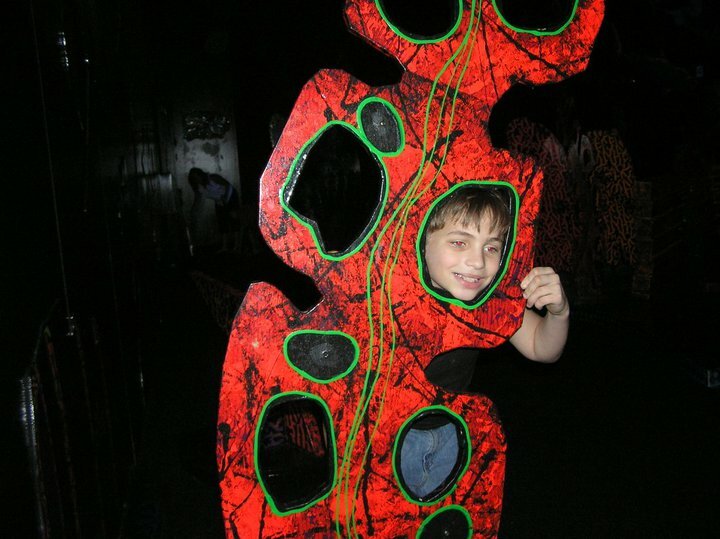 It's the same strategically wacky obstacle course you'd expect from an average mini golf course, but they also make for fun photo ops and crazy ways to liven up the times you may face a wait for an open hole. The course is challenging, but realistic. 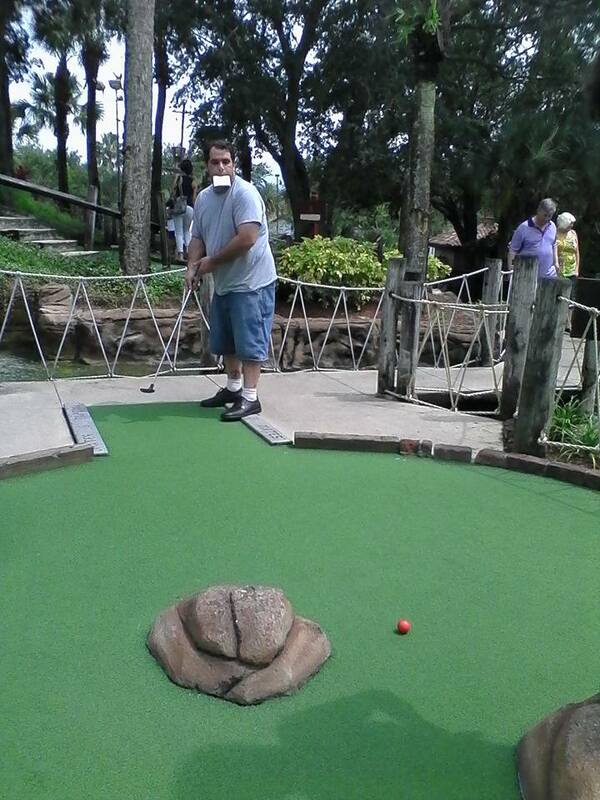 Even those of us who aren't so skilled at putting were able to hold our own with dignity. A unique little twist - Putting Edge has added a variety of challenges to the course to test your mental and physical skills. 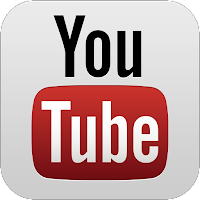 Try answering a few trivia questions throughout your game, or take your golfing experience to the next level with suggested trick shots! 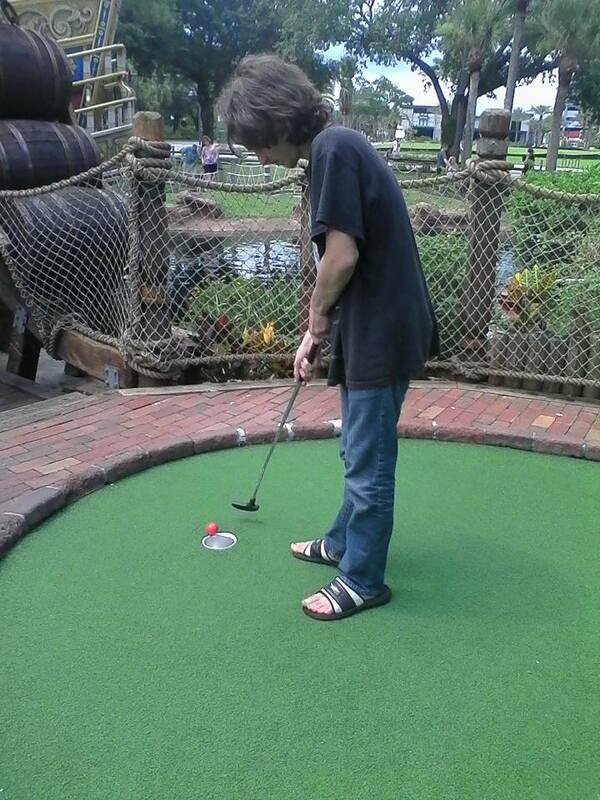 Putting Edge is $10.50 for ages 13 and over; $8.50 for ages 12 and under. 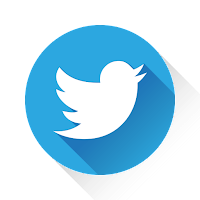 They are always running money-saving specials and fun social media flash sales, so be sure to check their website for $avings! If the weather isn't a concern, you can also opt to stay outdoors for the more traditional mini golf experience at Pirate's Cove. There are Pirate's Cove locations in 14 states across the nation - two in the Orlando area (I-Drive and Lake Buena Vista). 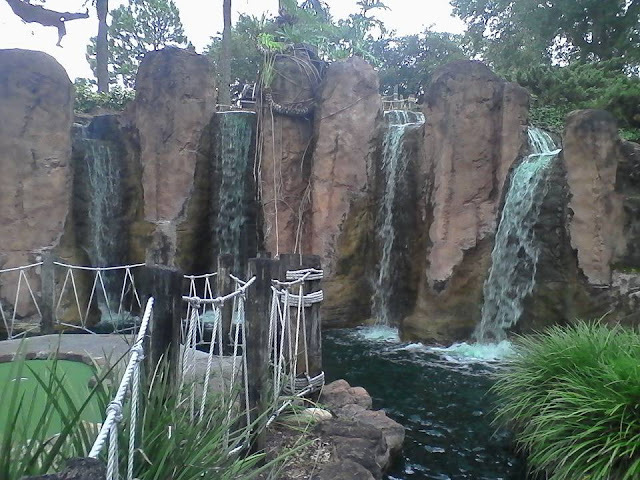 The I-Drive location features two 18-hole courses. Captain's Course is said to be more "scenic", while Blackbeard's Challenge is a bit more difficult. 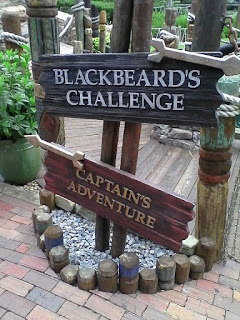 On our recent adventure, we decided to meet the challenge and conquer the demands of Blackbeard's quest! 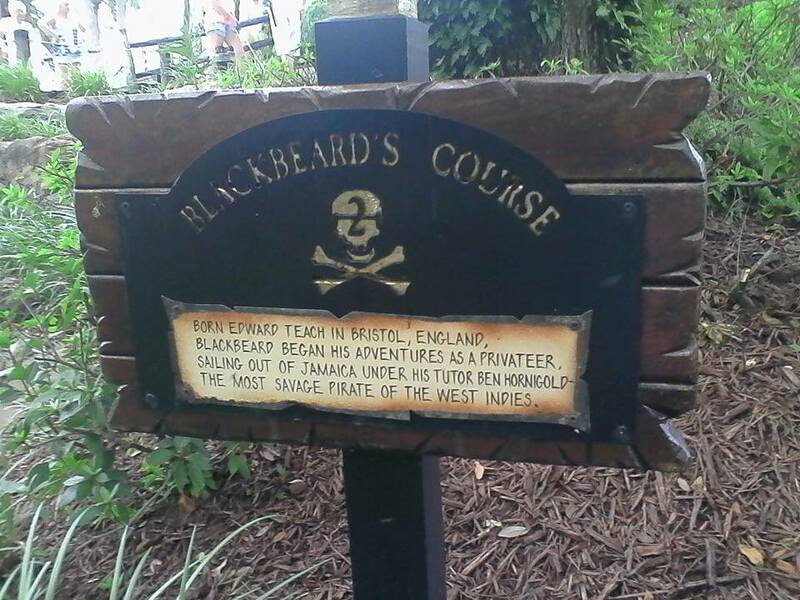 The course is lined with placards telling the adventuresome story of this famous pirate. Lush tropical landscapes are punctuated by the mandatory waterfalls and babbling brooks. 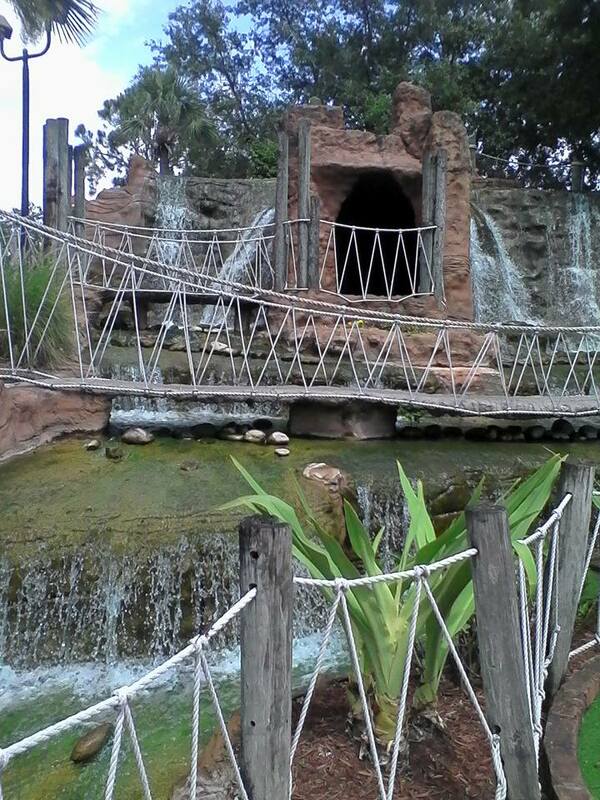 Climb the craggy rocks and cross the rope bridges as you wind your way through a swashbuckling adventure. Of course, all of this scenery means more opportunity to chop your ball right into the waterways... but that's all part of the mini golf fun, isn't it? It's common knowledge that I am a vocal opponent of the oppressive Orlando heat, but even in June, it's comfortably mild at Pirate's Cove. All of these gorgeous water flow zones work in combination with a reasonable breeze to keep the environment temperate and enjoyable. 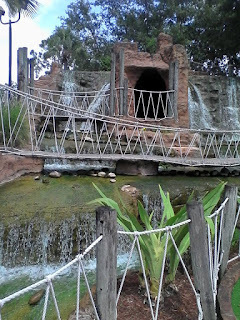 Pirate's Cove's Blackbeard course winds up and around this parcel of land, even making its way through a rustic pirate ship. The entrancing views from around Pirate's Cove are better than you'd expect on I-Drive. The atmosphere is genuinely transporting. Come to think of it, Pirate's Cove even resembles an authentic fantasy island from above, as you can see from high atop the neighboring Orlando Eye! 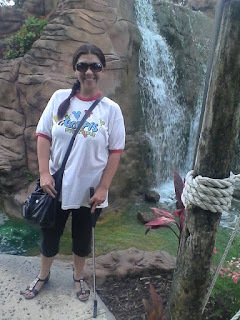 I'm proud to say that I wasn't the one who lobbed my ball over a waterfall this time around. 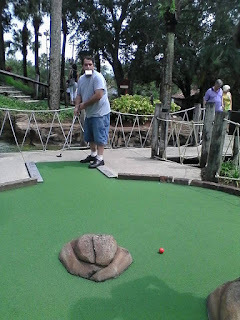 Always the bumbling goof void of coordination, I actually enjoyed a pretty close competition with my family at Pirate's Cove. Just enough pitfalls to make it daunting, but enough realistic arrangement to keep it possible to be on top of your game! 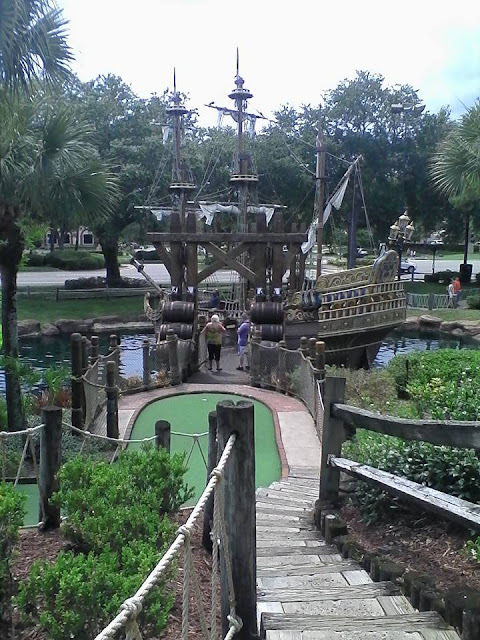 Pirate's Cove is $12.50 for adults; $11.50 for children - discounts available if you want a replay, or if you tackle both courses. They're open daily from 9:00AM - 11:30PM. Remember, I strive to show you that Orlando is so much more than just the big theme parks. Sometimes, it's so welcoming to find your amusements away from the lines, eternal walks, and pricey venues. Even activities that are seemingly mundane take on a whole new spin here in Orlando. Our lighter amusements realize they're being held to the area attraction standard, so they gladly turn their offerings up a notch. Don't miss out on some of our unique opportunities to enjoy everyday fun! Putting Edge and Pirate's Cove are just two of the many mini golf venues in and around Central Florida, but by my standards, they're the two that have the most to offer. Check them out next time you're in town!